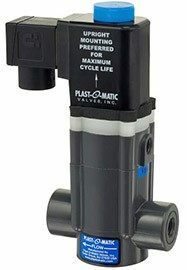 Normally Closed Solenoid Valves – Energize to Open – Plast-O-Matic Valves, Inc.
Series EASMT/EASYMT PTFE bellows design for pressure, drain, and vacuum service; for all types of aggressive chemicals, salt solutions, acids, caustics, and ultrapure liquids such as deionized water. Includes W24 fully rectified coil with Z-Cool DIN. Rectified R24 coil optional. Sizes from 1/4″ to 1″ in a wide range of materials and connection types. with extended cycle life featuring PTFE bellows. 1/4″ & 1/2″ sizes in Geon PVC, Natural Polypro, Kynar PVDF. Series PS requires 5 psi greater pressure at inlet to function properly. Uses line pressure to assist operation, which allows extremely high Cv performance, as well as outstanding pressure ratings. Pilot valve features PTFE bellows. Sizes from 1/2″ to 3″ in a wide range of materials and connection types. Series EASMT/EASYMT PTFE bellows design for pressure, drain, and vacuum service; for all types of aggressive chemicals, salt solutions, acids, caustics, and ultrapure liquids such as deionized water. Includes W24 fully rectified coil with Z-Cool DIN. Sizes from 1/4″ to 1″ in a wide range of materials and connection types. Includes patented Fail-Dry advance warning vent. Series EASMT/EASYMT PTFE bellows design for pressure, drain, and vacuum service; for all types of aggressive chemicals, salt solutions, acids, caustics, and ultrapure liquids such as deionized water. Sizes from 1/4″ to 1″ in a wide range of materials and connection types. Includes patented Fail-Dry advance warning vent. Series PS requires 5 psi greater pressure at inlet to function properly. Uses line pressure to assist operation, which allows extremely high Cv performance, as well as outstanding pressure ratings. Pilot valve features PTFE bellows. Sizes from 1/2″ to 3″ in a wide range of materials and connection types. Includes patented Fail-Dry advance warning vent. 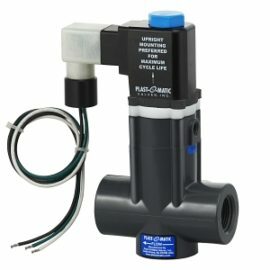 Series EAST for applications requiring a compact, cost effective and high pressure rated valve with extended cycle life featuring PTFE bellows. 1/4″ & 1/2″ sizes in Geon PVC, Natural Polypro, Kynar PVDF. Includes patented Fail-Dry advance warning vent.